This article remains for reference only. After moving print on demand (POD) paperback publishing from Createspace to Kindle Direct Publishing (KDP), Amazon has now announced a new division, Media on Demand. The information so far is limited, but there is a new Amazon page explaining how the move from Createspace to Media on Demand will work. There is also a basic welcome page, but the details are still sketchy. Of course, the impending closure of the part of Createspace that produces compact discs and MP3 files would seem to have little relevance for self-published authors. Well, apart from some old rockers like me, who gave it a try in years gone by when CDs and MP3 were still in fashion. I can’t believe that after all the years, my old CDs are still on sale on Amazon! But there is a big deal in this announcement for authors who are still using Createspace. The end seems to be nigh. Createspace has had a checkered history. It seemed like a fantastic way in the early days for self-published authors to have a published book in paperback and gain access to expanded distribution to make their books available for order by brick and mortar bookstores. But even with offering services to make ordering easy, bookshops never got very excited about having POD books on their shelves, and readers didn’t flock to stores to place orders. Why would they, when they could order on Amazon? But as far as online publishing services went, Createspace was always efficient and relatively easy to use to self-publish in print book. Its professional services were a bit expensive, but if you needed help with any part of producing a book, help was at hand. The one huge problem that developed though with Createspace service was in paying, or in fact, not paying royalties. The saga carried on for years and years, with many authors failing to be paid. Finally, Createspace made changes to its payment system, but it was in fact only a year or so before Amazon incorporated print on demand into KDP. 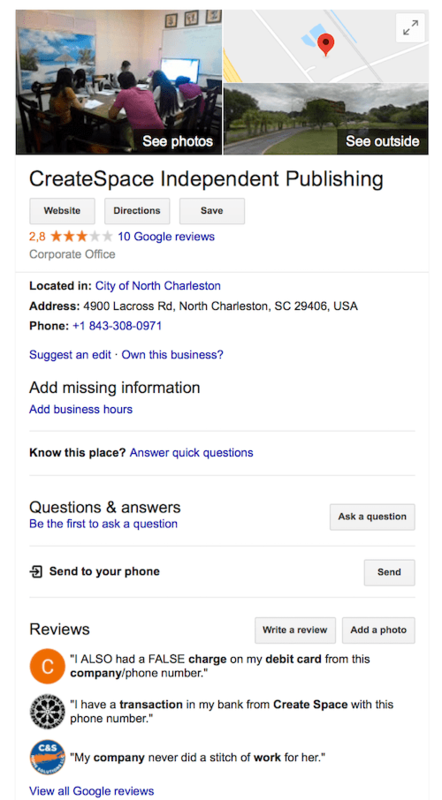 By chance, I was doing a Google search on Createspace HQ in North Charleston and came across this result. Look at the reviews at the bottom. It seems like Createspace is still causing issues for users. Media on Demand will take another large chunk of Createspace’s business. With POD books already moving to KDP, the signs are not looking good. If you are currently published with Createspace, I would highly advise that you consider moving your books to KDP in the near future, before you need to do it in a rush. Is KDP free to upload an update like CS was? If one did all their own work, CS was free- except when ordering a copy of your own book, of course. Oher PODs charge for initial uploads, updtes, and more in every way than CS. I thought CS was an Amazon partner anyway. No Why is Amazon dumping them then> All very disheartening. There is no charge for updating the content of a paperback book on KDP. Only the charge for a new physical proof copy. Createspace is owned by Amazon, so it seems to make sense to have both publishing options in one place.